Former Federal Reserve Board Vice Chairman Donald Kohn, NPR Interview, April 6, 2019. Rather than review President Trump’s picks, in this post we enumerate the key qualities that we believe make a person well suited to serve on the Board. Before getting to any details, we should emphasize our strongly held view that there is no simple prescription—in law or practice―for what makes a successful Federal Reserve Governor. History includes examples of former chief advisers to Presidents, academics with limited policy experience, and bankers. All served with distinction. Furthermore, no single person combines all the characteristics needed to make for a successful Board. Indeed, policymaking by committee is most likely to succeed when members resist groupthink. For that, diversity in thought, preferences, frameworks, decision-making, and experience is essential. A Board overly weighted toward academic economists, or persons exclusively with government or financial market experience, would not fill the bill. Nor would one composed predominantly of older white men (like us). With the benefits of diversity in mind, we highlight three common characteristics that we consider vital for anyone to be an effective Governor (or Reserve Bank President). These are: a deep respect for the Fed’s legal mandate; a clear understanding of an analytic framework that makes policy choices reasonably predictable and effective; and an open-mindedness combined with humility that tempers the application of that framework. In what follows, we discuss each of these, and then close with a brief description of the key benefit of an effective Fed: stable inflation and growth, and a resilient financial system. Respect for the Mandate. The Federal Reserve Act obliges the Fed to secure the “goals of maximum employment, stable prices, and moderate long-term interest rates.” All Federal Reserve officials should view these as the ultimate objectives for which they will be held accountable every day they are in office. Nothing comes before these—least of all the short-run, political objectives that inevitably motivate elected officials. Each year, the Federal Open Market Committee (FOMC) reaffirms these long-run goals while refining its monetary policy strategy. Since 2012, the FOMC has confirmed that an inflation objective of 2 percent is “most consistent” with its statutory mandate. The FOMC also is highly aware that the economy and financial system evolve over the medium term. To ensure that its policy framework will remain consistent with the statutory mandate and its inflation objective, for the first time, the Fed is engaging a wide-ranging review of its strategy, tools, and communication (see the recent speech by Vice Chairman Richard Clarida). In addition to using its monetary policy tools to maintain macroeconomic stability, the Federal Reserve is obligated to promote a safe and sound financial system. To this end, it enjoys extensive regulatory and supervisory authority over the nations’ banks. While the monetary policy and regulatory mandates are distinct, they are closely related: especially in the aftermath of the financial crisis, policymakers know that a modicum of financial stability is necessary to ensure maximum employment and stable prices. At the same time, there are potentially complex tradeoffs between these complementary goals. Finally, dedication to the Fed’s mandate means displaying unwavering support for the independence that is necessary to ensure that the central bank remains effective over the long run. Advocacy that threatens that independence jeopardizes the ability of the institution to fulfill its mandate. Analytic Framework. Effective policymakers are of many persuasions. While sharing the commitment to the Fed’s mandate, they often view the economy differently. Fed Governors and Reserve Bank Presidents have different information sources, weight various forms of information differently, and come to different conclusions on the likely future path of the economy. They also view the Fed’s various policy tools in dissimilar ways, differing on each tool’s relative importance and usefulness. In short, officials have diverse models of how central bank policy works—both monetary and regulatory—and have different views about how to achieve their statutory mandate. Partly as a result, as former-Vice Chairman Kohn suggests in the citation at the start of this post, to be effective, individual policymakers must be able to persuade their colleagues. This requires the skillful use of data and analysis. And, that requires a clear understanding of an analytical framework that draws policy conclusions from an evolving set of economic facts in a clear, predictable and quantifiable way. It also requires the ability to explain the resulting logic in plain language. The analytic framework could, but need not, come from a comprehensive knowledge of economic theory and econometric methods. For example, someone with a deep knowledge of economic and financial history, or intimate experience with the workings of financial intermediaries and markets, could use their expertise to inform their analysis. But, like any set of propositions, each person’s analytic framework must be subject to scrutiny and testing. Over time, only those ideas that pass the harshest examination are likely to survive and influence a committee that is committed to achieving the Fed’s statutory mandate. Embracing an analytical structure both ensures logical consistency and leads to predictability, the importance of which we cannot overstate. Monetary policymakers and bank regulators are most effective when people can anticipate their policies and act accordingly. Predictable policies anchor expectations—including those about future prices, emergency liquidity provision, and bailouts of bank creditors—that influence behavior today. Open-mindedness and humility. Having a predictable framework for analysis is one thing. Dogmatic commitment in the face of changing facts and improved theories is another. Effective central banking relies heavily on frontier economic analysis. But the frontier is constantly moving. Researchers take theories to the data. Those that pass the test rise, while others (perhaps once dearly held) fall. Not only that but, since all models inevitably ignore some potentially important aspects of the real world, policymakers necessarily employ judgement. To that extent, central banking is as much an art as a science, and is likely to remain so for the foreseeable future. For that reason, effective central bank officials are more passionately committed to the search for truth than they are to their own analytic frameworks. And they are humbly aware of the limitations of our knowledge of how the economy will react and how central bank policy actually works. Given the volume of information that is produced today―not only the data, but the high-quality work of both official sector and academic researchers―policymakers must make a prodigious commitment to learning. This means putting in the time to read and absorb complex technical information. It also means maintaining a profound respect for the views of others who are similarly engaged. And, most importantly, in building consensus for specific policy actions, it means relying primarily on internal opportunities for persuasion, rather than on efforts to deploy external political pressure. Critical Achievement: Stability. Over the past 30 years, the greatest success of the Federal Reserve has been delivering price stability. By first lowering inflation, and then keeping it close to the long-term goal of 2%, officials have reduced uncertainty, anchored long-term inflation expectations, and kept long-term bond yields low. Without governors who exhibit the three key characteristics—commitment to the mandate, well-developed analytic frameworks, and broad-mindedness—it would not have been possible to build the credibility necessary for this achievement. 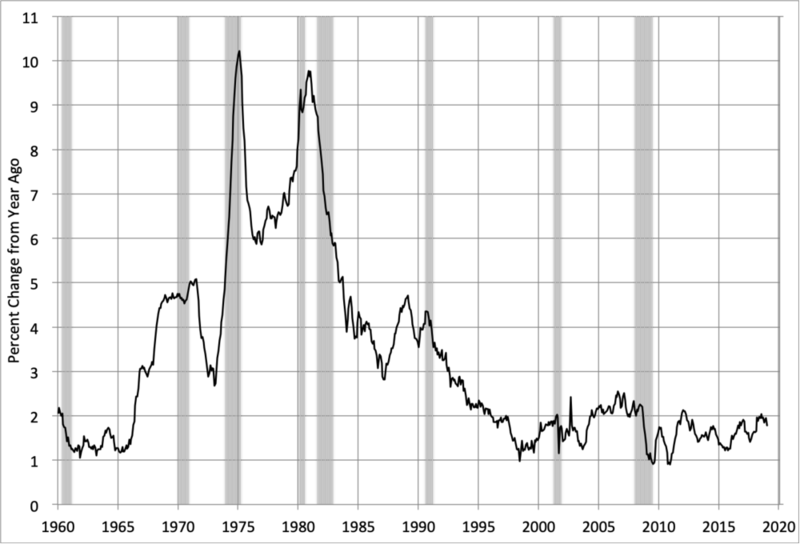 Note: Shaded areas denote recessions. Source: FRED. Conclusion. An independent central bank is one of the rare free lunches in economics: it can secure low and stable inflation without sacrificing long-run economic growth. But acquiring that free lunch requires that the institution be run by high-caliber technicians who shun short-run political aims, focusing instead on the long-run goals of price stability and maximum sustainable employment. In the same way that we want military commanders, public health officials, and nuclear or transport safety administrators to be apolitical professionals, so should we aim for central bankers with technical expertise that is above partisan politics. History is replete with disasters that resulted from the politicization of such key government functions. A transparent commitment to legally mandated goals by highly qualified specialists makes a central bank democratically accountable and allows it to earn the credibility it needs to be effective in promoting long-run prosperity. Were a central bank to be filled with political hacks, any formal independence would be meaningless and unsustainable, and we would all be the worse for it. Like Greg Mankiw, we hope that the Senate agrees. Acknowledgement: Without implicating him, we thank our friend and colleague, Richard Berner, for very helpful suggestions that have guided our thinking.